Cayuse will showcase our four Fall shows while serving tasty brunch bites and cocktails. Little Owls features early Native American children’s items. Clint Orms’ buckles, Susan Adams’ sterling and gold jewelry, and Dawn Bryfogle’s sparkling necklaces will all be on view. 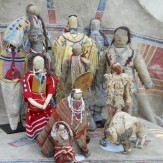 In addition, we have more antique Native American, Cowboy, and National Park items to peruse. Join us!